Parents / carers considering application to All Saints' are most welcome to visit the school by appointment. Derby Diocesan Academy Trust is the Admissions Authority for school.To apply for a place for your child at All Saints' you will need to contact the Local Authority. Parents who wish their children to be admitted to All Saints' must make their application directly to the Derbyshire Local Authority. Their telephone number for initial contact is 01629 533190. 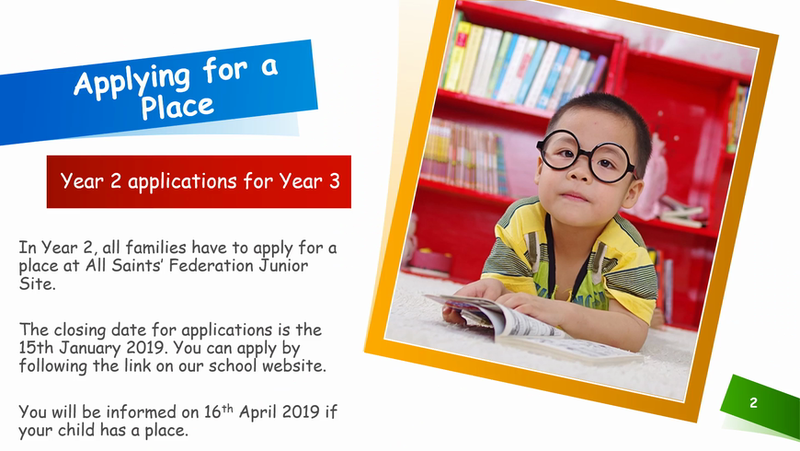 Follow this link (or copy and paste into your browser) for further information about applying for a school place, and to apply online. Please remember that parents need to apply for children to join the Infant school and then reapply to join the Junior school. All Saints' is able to admit 60 children per year. Infant classes of 5, 6 and 7 year olds may not, by law, contain more than 30 pupils with a single qualified teacher. Parents/carers do have a right of appeal in accordance with the Infant Class Size Regulations if the school is oversubscribed and their child is refused a place. An independent panel will be constituted to hear Admissions Appeals. The Derby Diocesan Academy Trust will arrange appeal hearings for either school in All Saints' CE Federation. Parents should lodge their appeal within 20 days with DCC, who will pass it on to DDAT to arrange a hearing within 40 school days of the deadline for lodging an appeal (School Admission Appeals Code Section 2). Waiting lists are ranked in the same order as the over subscription criteria listed below. Your child’s position on the waiting list may change. This means that a child’s waiting list position during the year could go up or down. Any late applications will be added to the list in accordance with the over subscription criteria. Inclusion on a school’s waiting list does not mean that a place will eventually become available. Our presentation to Year 2 parents.